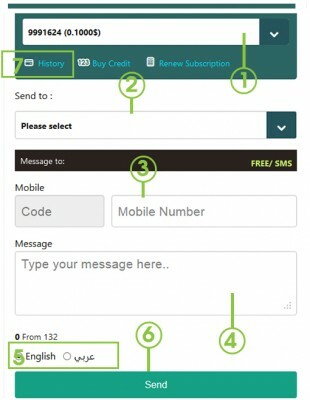 Customer can send SMS from GULFSIP numbers to any mobile number worldwide, we offer our customers 2 free SMS per day and any additional SMS will deduct from balance according to our SMS rates.
. Sign in to your account and Choose “Free SMS” from Services menu . 1. Choose GULFSIP number you wish to send SMS from. 2. Select the country you want to send SMS to, once the country has been selected the country code will be filled in automatically. 3. Type the mobile number you wish to send SMS to. 4. Write the message body with up to 132 English characters or 40 Arabic characters for free SMS. For paid SMS you can write up to 160 English characters or 70 Arabic characters. 7. You can check your SMS history .